" I have used this product before,I like this mask----IT WORKS,AND SO DOES THE PRICE!!!!!!!!! " 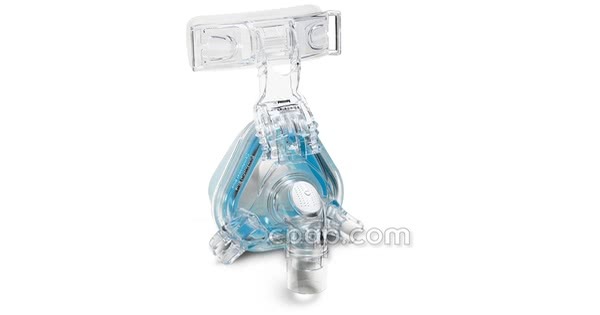 " a little different than what I have been using but works great "
The ComfortGel Blue Nasal CPAP Mask WITHOUT Headgear by Philips Respironics features an improved gel cushion and an adjustable forehead support. Angled micro exhalation ports located along the elbow of the mask reduce the overall airflow noise. The updated gel cushion is interchangeable and can be placed on Original ComfortGel mask frames when the ComfortGel Blue nasal cushion and the Original ComfortGel nasal cushion are the same size. This is a mask without headgear and requires a prescription. 30% of Nasal Mask product buyers choose this product. Philips Respironics' ComfortGel Blue Nasal CPAP Mask WITHOUT Headgear is made with a updated gel material, which is softer than the original gel. The improved design helps reduce noise and offers a suggested resistance control setting to be used on Respironics System One Machines. The ComfortGel Blue uses a dual, gel cushion and silicone flap system. Philips Respironics has improved the ComfortGel material, creating a more pliable gel, which conforms to the user's face with greater ease. Snap on the separate silicone membrane over the gel cushion to increase the life of the cushion. Sure Seal Technology refers to the contour of the seal around the Gel Cushion. The StabilitySelector is the adjustable piece of the forehead support which allows for movement. The pad is developed to accommodate the angle of the user's forehead by attaching to the base, which moves in a up or down direction. The ComfortGel Blue forehead pad has cushioning that is easy to fit and improves comfort. Smaller vents leave more surface area for additional micro vents. In this design, the 360 Degree Elbow holds more vents. The minimized ports diffuse airflow quietly, which reduces the overall sound of the mask. The angled aspect of the mask feature comes from the elbow, which allows the user to position the vents away from the bed partner. Resistance Control was developed due to the need for a machine to achieve optimal pressure, independent of the mask being used. Resistance Control is a numbering system located on all of Philips Respironics CPAP masks, which reflects variable resistance characteristics. Each number instructs the device to compensate for different mask types, resulting in consistent and reliable pressure enhanced with all the benefits of Flex Technology no matter which mask is used. 'Blue' Gel Technology is engineered to conform to facial features without the need to boil the cushion. Unlike the Original ComfortGel Nasal CPAP Mask, the ComfortGel Blue cushion cannot be boiled. If you have any problems with size or fitting, please call our toll free number 800-356-5221 for assistance from a CPAP expert. Locate the Sizing Guide button placed in the upper right corner of the product page. Ensure that the page will print in PDF format. Remove the Fit to Page option - guide must print at 100% or intended size. Using a mirror, place the cutout over the user's nose. Ensure that the fit is appropriate and surrounds the nose completely. Accuracy is the most crucial aspect of the sizing guide. To be certain that the mask is correct, conduct the test in front of a mirror. The clear line of vision will help to determine if the size is not precise. Also, assistance from another person may positively impact the accuracy of the sizing guide. Comfortable and effective therapy will be found in the smallest mask that extends past the nostrils without interrupting airflow. ComfortGel and ComfortGel Blue mask frames an cushions are interchangeable, but the cushion and frame must be the same size. ComfortGel Blue Cushion for ComfortGel Nasal CPAP Masks will work with either mask. The same size silicone flap must be used to secure the gel cushion to the frame. For help with changing out the ComfortGel Blue cushions or for fitting directions please review: ComfortGel Mask Instructions. 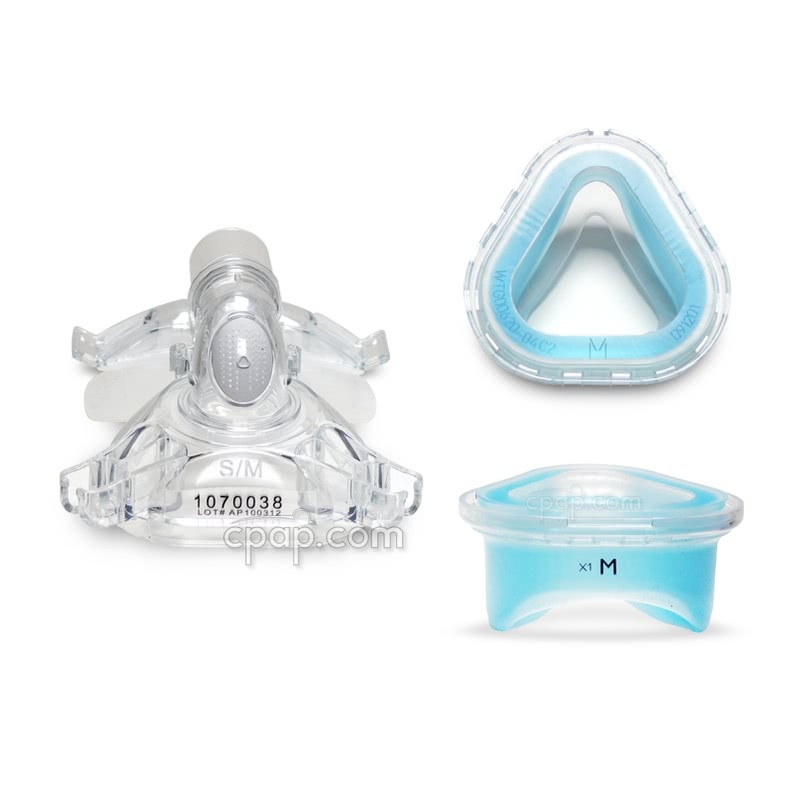 The ComfortGel Blue frame comes in three different sizes (see Replacing Mask Frames above) and is labeled with a letter and a part number, both designate the mask size. When examining the front of the mask, the size and part number are located just below the mask elbow. To find the size of the nasal cushion, turn the mask so that you are looking directly at the bottom of the nasal cushion. The gel cushion does not have an identifiable size. Use the letter indicated on the silicone flap to determine the size of the nasal gel cushion. The nasal cushion is replaceable. Sizing Indicator Update 2015: In 2015, Philips Respironics changed the sizing indicator on the silicone flap for ComfortGel Blue Series Nasal and Full Face Masks. Previous to 2015: A black letter is printed on the bottom of the flap to indicate the size. Current Design: A raised, clear letter is embossed on the bottom of the flap to show the size. All sizes of the ComfortGel Blue come packaged from the manufacturer with the Standard size of the Premium Headgear with EZ Peel Tabs for Comfort Series Masks Part Number 1033678. Both available sizes of the Premium Headgear may be used with the ComfortGel Blue mask. Resistance Control is a numbering system on all new Respironics CPAP masks and based on variable resistance characteristics. Each number instructs the device to compensate for different mask types. The result is a consistent and reliable pressure, enhanced with all the benefits of Flex Technology, no matter which mask is used. 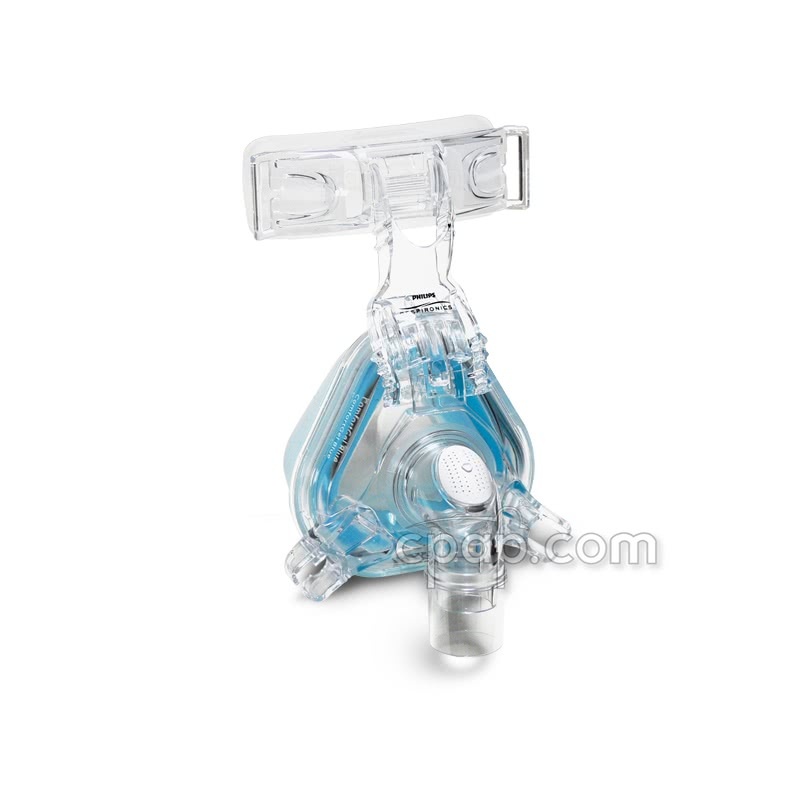 The resistance control number for the ComfortGel Blue Nasal CPAP Mask is X1. Please Note: System One Resistance Control is for System One Machines only.